These Chili Cheese Fries are the stuff that dreams are made of! There is a restaurant here in town that makes the most epic chili cheese fries you can imagine. They put this absolutely incredible cheese sauce on the plate first and then pile the chili and everything else high on top of the fries. And then drizzle with more cheese sauce over everything. When I tried them for the first time, I was blown away. Cheese sauce… on.the.bottom. What genius is this!!! And they are so, so, so good. The flavors are just phenomenal. Of course, I wanted to figure out how I could create these ultimate cheese fries at home. Because I need them in my life regularly. For an alternative chili recipe to use, try our beef and bean chili. A friend of ours, Daniel, went through culinary school so naturally, I like to pick his brain whenever I get the opportunity. 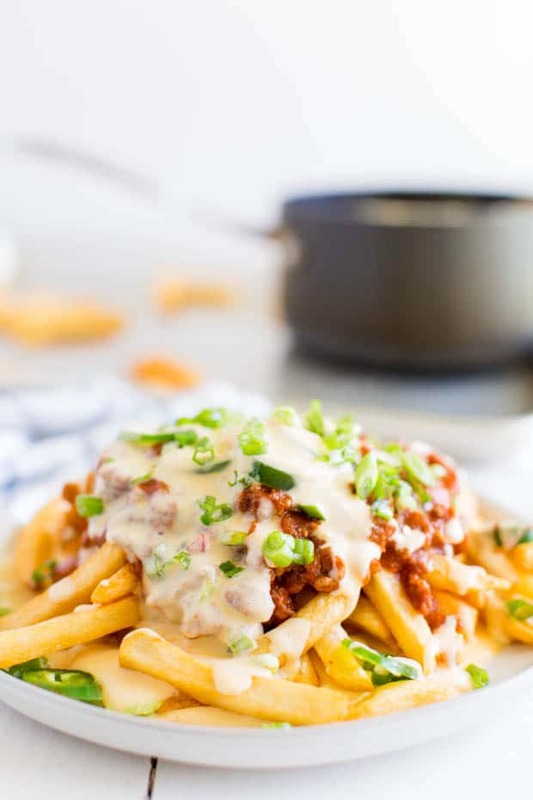 Last time we were together, I asked him how to make a really good cheese sauce… because I was dreaming of these chili cheese fries and I knew I needed to get the cheese sauce on point for them to be amazing. RELATED: This chili dog recipe is amazing. In my experience, cheese sauce can be so hard to nail down so it doesn’t just taste like milk, but actually has substance and boasts an intense cheese flavor. I knew Daniel possessed the answers I needed. Daniel explained it all comes down to fat content. So heavy cream and lots and lots of cheese make the magic happen. It’s a 1 to 5 ratio for success: 1 cup of cream to 5 cups of cheese. Oh, yessss. Bring on the cheese. This is definitely one of those YES! I NAILED it recipes! 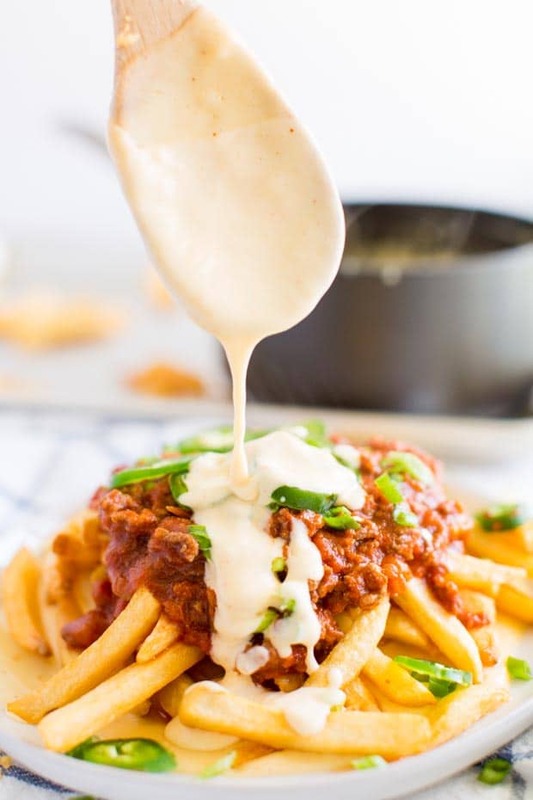 The chili is packed with flavor (I used my basic chili recipe as the foundation), the cheese sauce is EPIC and the French fries were glorious and crisp. It’s the ultimate trifecta! I’m sharing this recipe thanks to the support of Mirum and its advertiser Omeprazole. I’ve recently been introduced to Omeprazole Orally Disintegrating Tablets. Game changer! You can take it with you anywhere, and you don’t need water to take it. It dissolves quickly on your tongue. Armed with Omeprazole ODT, I’m ready to dig into this chili cheese fries recipe any day of the week. 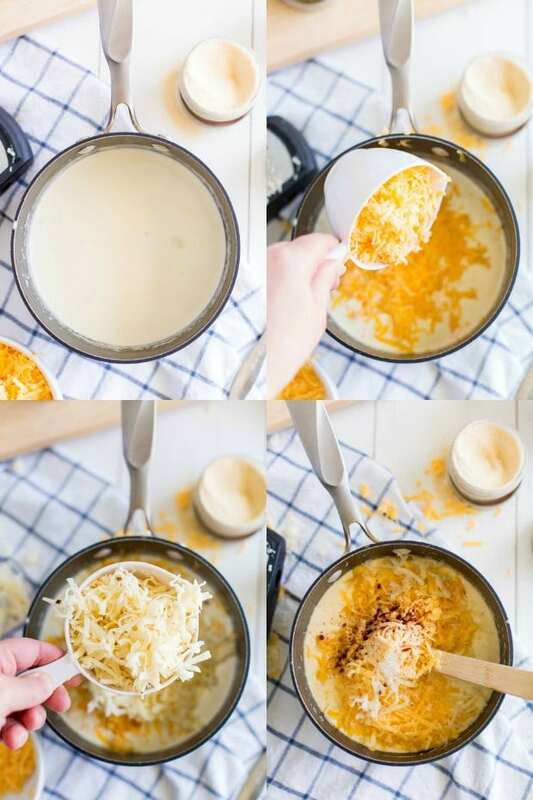 For the cheese sauce, you’ll need heavy whipping cream, extra sharp cheddar cheese, pepper jack cheese, salt, onion powder, garlic powder and chili powder. You can make your own tomato sauce, if you’d like. Finally, you’ll want a bag of your favorite frozen fries plus jalapenos and green onions for garnish. 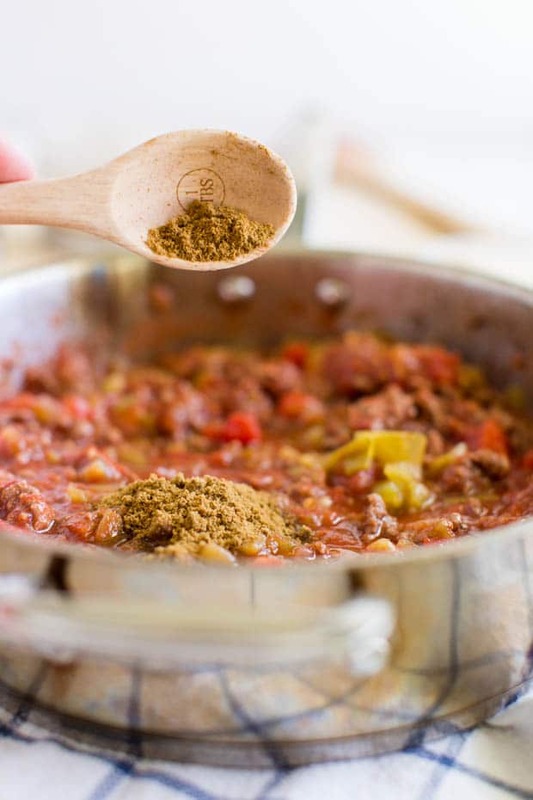 If you want to make this recipe with turkey, check out my recipe for turkey chili. You’ll prepare the French fries according to the package directions on a baking sheet. In a skillet, sauté a diced onion until it starts to become translucent. Then dd the ground beef and cook until all the pink is gone, then drain the fat off. Next add the tomato sauce, tomato paste, diced tomatoes, green chilies, water and seasonings. Stir and let simmer for 3-5 minutes while you shred the cheese. Go here if you want to make your chili in your crockpot instead. In a medium saucepan, heat up the heavy cream until bubbles start to form around the sides. Reduce the heat to low and stir in the cheeses and seasonings until the cheese is completely melted. Now you’re ready to assemble the toppings. Spread some of the cheese on the bottom of a plate, then pile the French fries on top of the cheese. Add a little more cheese, then top with chili. Finally, add more cheese sauce and garnish with green onions and jalapeno. If by some wonder you don’t devour this in one sitting, you clearly have more self-control than me! Should this happen, you can preheat your oven to 350 degrees and pop your leftovers on a baking sheet. Place in the oven for a few minutes — usually around 10 — and then voila! You can enjoy more chili cheese fries. You can take these up another notch by adding crispy, crumpled bacon on top. You could also make them with pastrami, with beef or with potatoes instead of fries. A really great variation on this recipe is my chili dogs my husband and son love them. You could also try my chili mac if you want to get dinner on the table FAST. Get busy in the kitchen making these incredible chili cheese fries now. 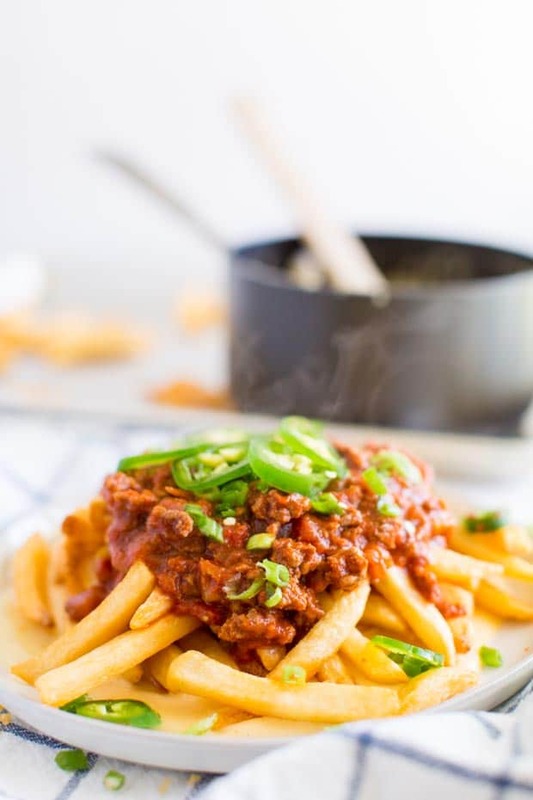 These incredible easy Chili Cheese Fries are the perfect meal or appetizer! Prepare French fries according to package directions. In a skillet, sauté diced onion until they start to become translucent. Add the ground beef and cook until all the pink is gone. Drain fat. Add the tomato sauce, tomato paste, diced tomatoes, green chilies, water and seasonings. Stir and let simmer for 3-5 minutes while you shred the cheese. In a medium sauce pan, heat up heavy cream until bubbles start to form around the sides. Reduce heat to low and stir in cheeses and seasonings until the cheese is completely melted. 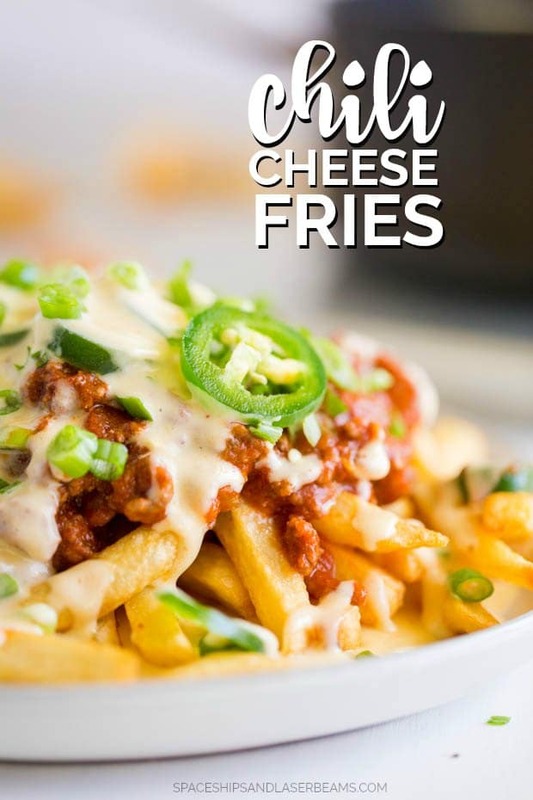 To assemble the dish, spread some cheese on the bottom of the plate, then pile the fries on top of the cheese, add a little more cheese, top with chili, more cheese sauce and garnish with green onion and jalapenos. We LOVE this — it’s SO easy and cheesy and delicious. whooo! chili cheese fries.. will definitely make this on weekend! OMG! You can never go wrong with fries. Will definitely be making this again! Make your own fries. Don’t buy frozen.